First off, any group of people who unanimously vote Chuck Schumer, the most useful idiot who ever lived, back into leadership after he helped fill the judiciary with Trump’s judges should not be trusted. The short answer to what is the problem with the Democratic Party is the litany of feckless Senate Democrats who do nothing but capitulate to Republicans over and over and over. This longstanding tradition of “compromising” with Republicans while eschewing liberal priorities has reached a breaking point, as the IPCC issued a dire warning that unless we do something truly revolutionary and pivot our economy away from fossil fuels in the next ten years, the Earth will become incredibly hostile to life in twenty years. This is literally a fight for our survival. We have no time left for half-measures, yet Chuck Schumer wants to put a man famous for shooting a bill designed to combat climate change at the top of the powerful Senate Energy and Natural Resources Committee. 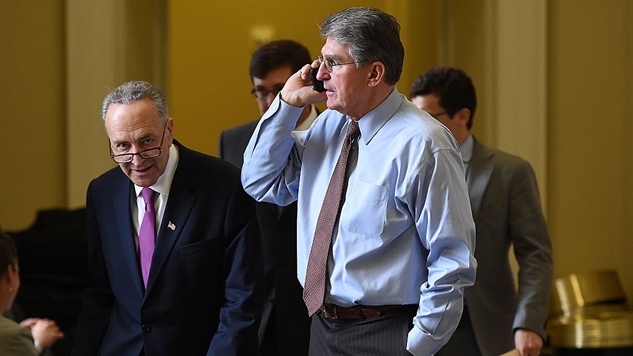 Jay Inslee, the governor of Washington state, is launching a petition to demand that Chuck Schumer, the Senate minority leader, block Manchin from serving as the top Democrat on the Energy and Natural Resources Committee. We can have a habitable planet, or the economy we all “enjoy,” but we can’t have both. This is an unadulterated fact and anyone who disagrees is standing in the way of an initiative to save mankind as we know it. Time ran out a long time ago, and we are already experiencing the horrific effects of climate change, and all that is left for us to do is to avoid the worst-case scenario. Putting Joe Manchin in charge of climate policy puts us all on the path to extinction, not salvation. Not to mention, fighting for the survival of mankind is politically popular! A new poll shows that a whopping 72% of Americans think that climate should be a higher priority, and half of Americans think it should be the top priority. For all the talk of “purity tests,” and how they supposedly hurt the Democratic Party, that’s exactly what we need going forward on the topic of climate change: are Democrats going to step up and try to save the planet or are they going to conduct business as usual? If it’s the former, then they should be incorporated into the new Democratic coalition that’s trying to build a better future, if it’s the latter, then people like Joe Manchin should just drop the charade and become the Republicans they have proven to be.